UPS Inc. reported fourth-quarter earnings that beat Wall Street expectations, the package delivery company reported Jan. 31. “Our diverse portfolio, global footprint and flexible network position UPS for profitable growth in 2019 and beyond,” CEO David Abney said. Net income was $453 million, or 52 cents a share, compared with $1.24 billion, or $1.42 a share, for the same period a year ago. However, excluding nonrecurring items including a $1.24 billion mark-to-market pension charge, adjusted earnings per share jumped to $1.94 from $1.66 in 2017. This was above analysts’ expectations of $1.90 a share. The Atlanta-based company, which ranks No. 1 on the Transport Topics Top 100 list of the largest for-hire carriers in North America, said revenue from all of its divisions — including domestic and international package delivery and its supply chain and freight operations — increased 4.6% to $19.85 billion from $18.98 billion. Domestic revenue was up 6.3% to nearly $12.58 billion from $11.8 billion in 2017.
International revenue inched up 2.9% to $3.82 billion from $3.72 billion last year, and the company’s supply chain and freight division saw an increase of just 0.7% to $3.44 billion from $3.42 billion in 2017. Officials said in recent years UPS has spent billions of dollars to improve its network operations, opening or retrofitting 22 facilities in 2018, including a new automated center in Atlanta in October. “As we start 2019, 18 additional new and retrofit facility projects are underway, with completion dates ahead of peak this year,” Chief Operating Officer Jim Barber said. The company said its quarterly domestic operating profit fell 8.1%, to $999 million from nearly $1.1 billion in 2017, because of expenses tied to the building and opening its new facilities. The new Atlanta center, which cost $400 million, sits on 321 acres in an industrial park on the city’s west side, 20 miles from headquarters. The automated facility can be expanded to increase the 1,700 packages a minute it currently is able to process. It also will serve as a blueprint for future UPS ground centers. 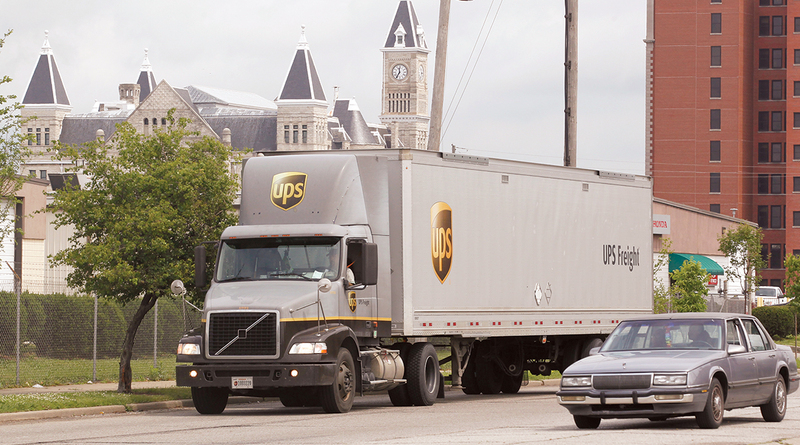 Those investments are paying off; UPS delivered 21 million packages a day in the United States during the fourth quarter, which includes the holiday shopping season, and its on-time delivery performance was a record. UPS said in a conference call that in 2019 it intends to focus on generating more profitable revenue as it targets medium and smaller businesses. It also aims to deliver more medical and health care shipments, which generally carry higher margins than shipping packages for giant companies such as Amazon.com.